In an eerie reminder of the cost of abusing the environment, Jim Robbins in an article for the New York Times Sunday Review – The Year the Monarch Didn’t Appear – noted that this year “for the first time in memory” the butterflies did not fly to the central Mexican forests for their annual migration on November 1st, as they have for centuries. Where have I heard that before? Barbara Kingsolver used that premise in her novel Flight Behavior. Have you read it? 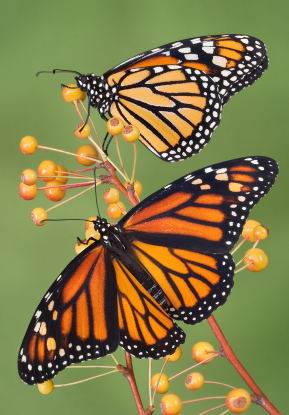 I’m planning a trip to Pacific Grove, California next year – one of the stops for the monarch butterfly’s migration I wonder if they will be there. The butterfly effect, global warming, the hills of Appalachia, and a feisty heroine converge in Barbara Kingsolver’s Flight Behavior to create her best story yet. In Fight Behavior, Kingsolver connects the yearning of a young bright Appalachian woman with missed opportunities to the crisis of global warming and the potential extinction of a kaleidoscope of butterflies who have been misdirected by the miscues of nature. The butterflies bring change and revelation in unexpected ways. Dellarobia Turnbow had the potential to make something of herself, but she got pregnant in high school, married the local farm boy, and settled into an unsatisfying life, working the sheep farm with her in-laws – until one day, when she discovers a miracle that changes her life. Monarch butterflies migrating south for the winter appeared in the green hills behind the farm, attaching themselves to the trees Dellarobia’s father-in-law had decided to cut down to manage his debts. Kingsolver adroitly manages the confluence of the local gossips, their church, the persistent news woman, and a diligent scientist, as the presence of the monarch butterflies slowly becomes the focal point of the small rural town. At first, the characters fall into stereotypical roles – the demanding mother-in-law, the well-meaning farmer husband, the egghead scientist – but Kingsolver forces the reader to shed all judgemental assumptions by revealing their underlying natures. Dellarobia is as simmering and brilliant as the beautiful butterflies hanging from the trees – all ready to take flight unexpectedly. Her children – six-year-old Preston, with his burgeoning interest in science fueled by a 1950s encyclopedia, and toddler Cordelia – at once tie her to her life while offering her a promise to make it better. Ovid, the scientist who creates a camp behind the barn, and later establishes a lab on the farm that not only draws in Dellarobia but also allows her to exercise her intelligence and freedom. He creates more questions than answers and through him, Kingsolver educates the reader. The fight and flight behavior persists throughout the story as both Dellarobia and the monarchs struggle for survival. Kingsolver neatly points to a hopeful future before she ends with an unexpected blow that might not be a surprise if the reader is carefully attending to the consequences predicted when nature is ignored. But I didn’t see it coming, and maybe that’s the point – none of us ever do. A book with a message and characters who will stay with you. As ever, Kingsolver does not disappoint.